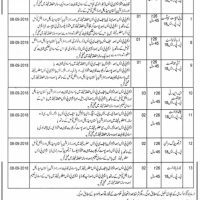 Various jobs have been announced by Lahore Cantonment Board. Teaching Staff is required in the Cantonment Board, Lahore. Appointment of the candidates will be made by the Administration of Lahore Cantonment Board. 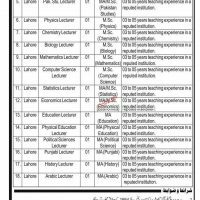 All the people looking for Government Jobs in Lahore are hereby informed that several lecturers including Principal is required in the College. Candidates having experience from 03 to 05 years in reputable educational institutions are invited to submit their applications. Last date for submission of application forms along with necessary documents has been fixed as 3rd September-2018. Cantonment Board Colleges referred to CB Colleges is educational institution. This Institutions is being run under the administrative control of Lahore Cantonment Board which is an organization of Pakistan Army. CB Institutions are known as best educational institutions of the Pakistan. Service structure shall subject to Pakistan Servant Rules 1954. Appointment of the posts mentioned in the advertisement shall be made on contract for one year. Pay & allowances shall be given on the basis of experience and qualification. Cantonment board has rights to cancel / amend the advertisement. Attested Photocopies of academic qualification / experience certificate / NIC / diplomas and courses must be submitted alongwith application. Interested candidates must submit application in name of Imran Gulzar, Chief Executive Officer, Cantonment Board, 42 Sarwar Road, Lahore Cantt. Further detail about the posts can be obtained from the official website of the board i.e. 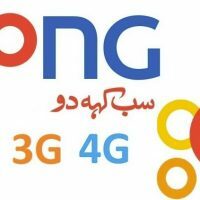 lcb.gov.pk. Moreover, let us know, if you have any question about the advertisement. Our expert team will be provide any information you want. It is mentioned here to apt that you must submit application alongwith necessary documents must be reached to the office of Cantonment Board within the stipulated time of period. Thank you for visiting us.